We aim to nurture our children’s creativity and their aptitude for, and interest in, Art and Design Technology in both weekly curriculum lessons and after school. Pupils are introduced to a variety of art media and techniques with topics often sharing cross-curricular links. Their finished work is displayed proudly around the school. Extra-curricular Art and DT clubs allow them to experience different topics and build on the techniques they learn in class. Pre-Prep Art is timetabled and classroom based, with the flexibility to adapt and link with a topic the children are working on. The work of famous artists is studied and reproduced by the children. 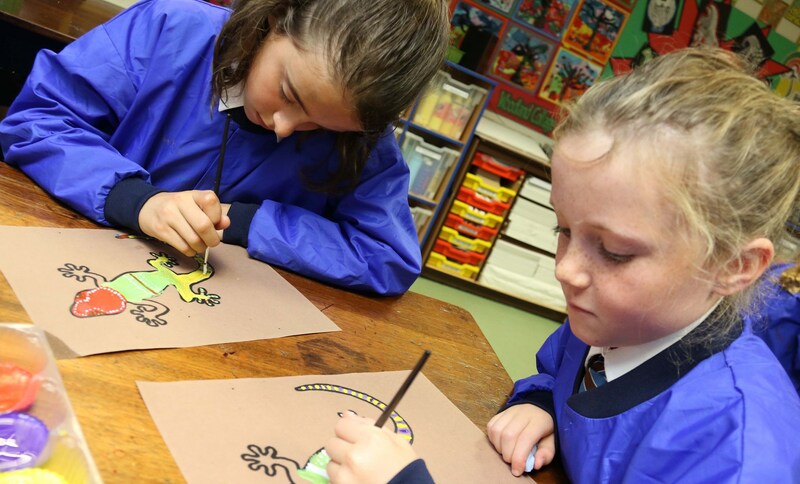 Pupils in Year 3-6 have two timetabled Art lessons per week in our dedicated art room, which is equipped with art tables for larger scale work, drying areas, shelving and display areas. The 7 basic elements are taught from Year 3: colour, value, line, shape, form, texture and space, as well as topic-based learning linked with, for example, History, Geography and English, the children study and reproduce the work of artists as well as learning some basic art history. Year 3 topics might include Kenyan art, Year 4 may learn techniques of figure drawing and produce work linked with rainforests, while for Year 5 it may be Aztec art, the work of Kandinsky and water colour. In Year 6 children work on perspective and pencil drawing and are inspired by artists such as William Morris. They build on their reproduction work by choosing a painting they will see at the National Gallery during the Michaelmas term trip to London and extend their learning by deconstructing the work and focusing on an element to develop. From an early age children have timetabled Design Technology lessons, which give them to chance to think about basic technological concepts and to create their own product, typically linked with other areas of the curriculum, for example in Year 2 making a lighthouse linked with study of the Katy Morag books. From Year 3 the children create a termly design folio which contains research and brainstorm sheets leading to a final design, which they then evaluate. Topics for Years 3 to 5 might include packaging, theatre masks, jewellery linked with History, balloon-powered vehicles linked with Science, food technology and making Christmas decorations using textiles. In Year 6, the children enjoy lessons in Senior School and experience computer aided design (CAD) and 3D printing in preparation for future technology lessons.